New Dual Lane Weigh Filler Model S-7 includes: •	Two lanes for twice the speed •	Self-adjusting controller •	Reads out to 1 gram or .001 lbs. •	Controller range up to 10 lbs. •	5.1 cu.ft. supply hopper •	All product contact surfaces 304 stainless steel •	Support Frame: o	Powder Coated o	Footprint 7.5 sq.ft., 74.5" high o	4 locking casters •	120V 60Hz (240V 50Hz option) •	Handles all dry bulk products from powders to large parts •	Compatible with all bags, rigid containers, and bagging machines •	Automatic tare adjustment •	On-the-fly, self-adjusting bulk & dribble speed control •	600-1200 fills/hour Information: The model S-7 two lane net weigher share many of the same basic characteristics of the S-4. A very accurate and easy to use Logical Controller II allows for three different modes of operation. In simultaneous dump the machine fills both weigh hoppers at the same time, allowing for twice as much product flow as the model S-4. In individual dump the machine dumps whichever weigh hopper is at weight. Finally the model S-7 can mix products. 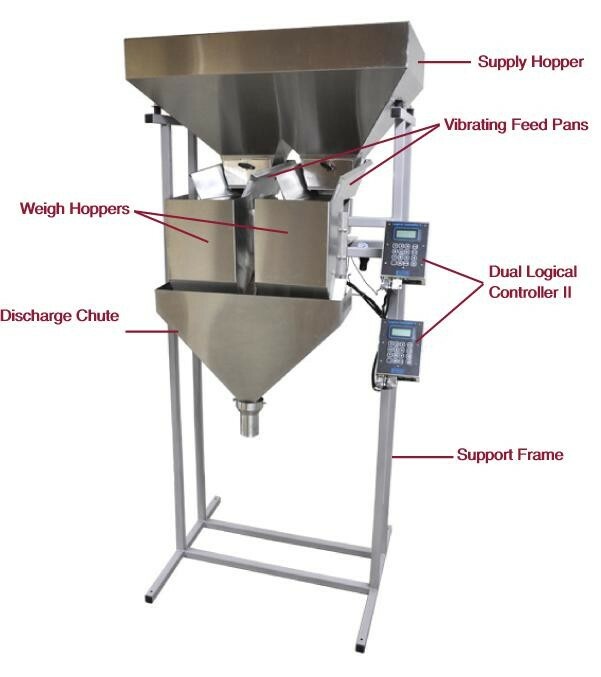 The Logical Controller II can be set to weigh two different products at different weights to easily mix products into a container. Specifications: •	Overall height: 5'8" (68"), occupies only 30" x 34" of floor space •	Hopper Size: 36" x 24" (5.1 cu.ft. product capacity) •	Scale Total Weight: 225 lbs. •	Standard Funnel Size: 2.5"x2.5" •	Power Requirements: 2 amps, 110 volts 60Hz AC •	Air Requirements: <1.0 cfm air supply at 30psi Delivery Timeframe: 4-5 Weeks.